Scientific periodic magazine «Questions of geography and geoecology» is published since 2007, and has international ISSN 1998 – 7838 and subscription index of Kazpost – 24155. Periodicity of magazine publishing is 1 issue in a quarter, 4 issues in a year. Founder and publisher is LLP «Institute of geography», Almaty, Republic of Kazakhstan. Impact-factor – 0,016 (by the data of Kazakhstan citation data base of JSC «NTs NTI»). Texts of articles could be provided in Kazakh, Russian and English Languages. 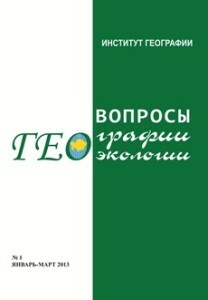 The magazine main goal is comprehensive presentation of theoretical and methodical achievements of geography and geoecology in Kazakhstan and abroad, their uses in practice of economic and public life, and also discussion of a wide range of actual questions of geographical and geoecological sciences. In the magazine are published articles devoted to problem questions of geographical science and geoecology, and also scientific messages of theoretical, methodical, experimental and applied character, thematic reviews, critiques and reviews, including in the form of letters to editorial staff, bibliographic reports, chronicle of a scientific life, information on activity of local and international organizations of geographical and geoecological directions. The magazine is purposed for the faculty of the higher and average professional educational institutions, master’s and PhD students, employees of scientific and research institutes, ministries and departments, experts of the profile enterprises and organizations. Editorial board of magazine has the expanded structure with participation of foreign scientists and includes experts from different branches of geographical science and geoecology. For reviewing of articles submitted to magazine, local and foreign experts of all branches of geographical science and geoecology are involved.